For as long as I can remember, I’ve always been succumbed with an irrational fear of snails. It’s embarrassing. More common, less hilarious fears (spiders, snakes, rats, death) have never phased me, but something about those lettuce-munching bogies in crash helmets would always plague me with fear. As somebody who dedicates such a portion of my life to writing about restaurants, I appreciate that it’s crucial for me to eat just about everything. So much so that over the past two years I’ve found that there’s actually nothing I won’t eat (or try, at the very least). I’ve eaten and tolerated l’escargot in the past, of course, but never if they’re easy to avoid. So it speaks volumes of my respect for Heston Blumenthal (the chef renowned for his snail porridge, amongst other outlandish creations) that I made an exception on a recent visit to Dinner by Heston Blumenthal – the chef’s two Michelin-starred restaurant at The Mandarin Oriental in Knightsbridge. All of the food served at Dinner is developed under the watchful eye of Chef Director Ashley Palmer-Watts, having previously worked as Head Chef at The Fat Duck in Bray. Alongside constantly pushing boundaries with his unique take on molecular gastronomy, what’s particularly interesting about Heston Blumenthal’s approach is the prominent focus on food history, with so many of his culinary creations surrounded by a wealth of context. Following the success of his TV programme Heston’s Feasts, the chef launched Dinner in 2011 (his only restaurant in London) with each of the dishes served deeply rooted in history. The a la carte menu features the likes of ‘Meat Fruit’ and ‘Tipsy Cake’. Meat Fruit (£18.50) is Heston’s famous rework of a Middle Ages classic, in which chefs would disguise ingredients to create a notion of theatre – typically mounds of minced pork masquerading as golden apples. Here, the kitchen cloaks a mound of chicken liver parfait with a thin layer of mandarin jelly to resemble a pitted, dimpled mandarin. Served with some toasted sourdough, the dish is not just theatrically impressive – the parfait tastes genuinely delicious. Tipsy Cake (£14.50), on the other hand, was a popular Victorian dessert of booze-soaked cake (traditionally sponge), served here as a saccharine tear and share brioche with a hunk of spit-roasted pineapple. Offered alongside the a la carte menu, the set-lunch menu with three courses at £40, asserts some of the city’s best value. With two choices for each course, starters include dressed snails (c.1880) and hay smoked salmon (c.1730). If you are able to forgo the unkind texture, the snails have a remarkable earthy flavour that works in harmony with the parsley and brackish anchovy, while the freshness of a large lettuce leaf neutralises the palate. The salmon, on the other hand, does have an underlying taste of hay – but it’s somewhat overpowered by a salad of pickled lemon and a vast quantity of pleasant, albeit overwhelming, smoked beetroot. Far better is a main of two roasted quail breasts and confit legs, beautifully cooked and butchered. Contrasting the magenta hue of flesh that’s vaunted by the bird, an explosion of auburn comes with the most delightful cube of confit delica pumpkin and silky puree that brings exceptional depth to the dish and is paired perfectly with the gaminess of quail. This is a dish of both tremendous balance and culinary skill. To finish, a heavy custard-textured marmalade pudding delivers notes of bittersweet orange, accompanied by a lemon and thyme ice cream that brings a refreshing lightness to the dessert. Also from the a la carte menu, a scoop of ice cream (£8.50) made table-side with liquid nitrogen is available, served in a sugar cone with a selection of toppings. Although expensive, the ice cream is worth ordering purely for the element of theatre, if nothing else. As well as serving food that’s mostly world class; the restaurant is undeniably classy yet without the stuffiness associated with fine dining. This is aided by service that’s friendly and attentive, but without ever becoming overbearing, while the open kitchen and stunning views onto Hyde Park make it easy to forget that this is a hotel restaurant. Furthermore, the set lunch menu at Dinner by Heston Blumenthal offers a two Michelin-star experience at EasyJet value. And that, alone, is an offer that cannot be refused. 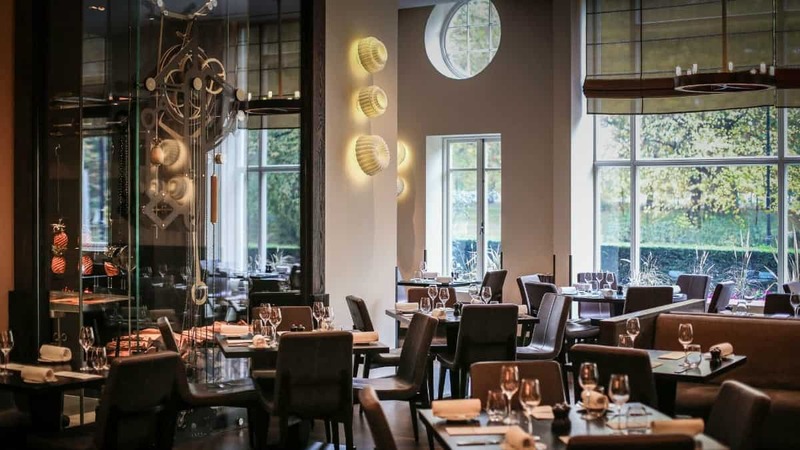 Dinner by Heston Blumenthal can be found at Mandarin Oriental Hyde Park, 66 Knightsbridge, London, SW1X 7LA.